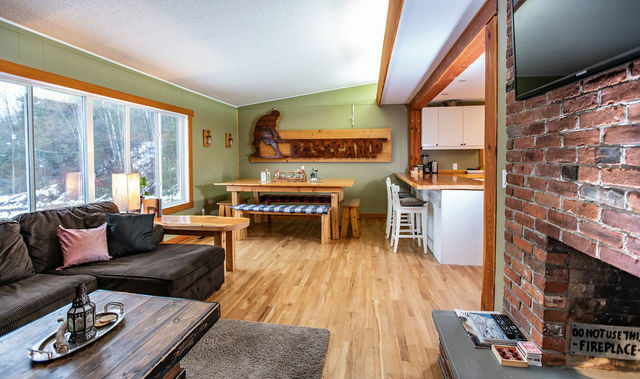 Basecamp Cabin is a premium and centrally located vacation rental, fully outfitted for you to enjoy everything Revelstoke has to offer. This property is heavily discounted from April 1st through to the end of the season. It's a skier's dream; walk in from a covered single car carport to a large boot room with more than enough space for all of your gear to dry safely on the racks before the next pow day. The boot room opens up to an open concept kitchen with locally sourced wood countertops and stainless steel appliances, a large dining room with seating for twelve and a cozy living room with flatscreen tv, cable and wifi throughout. Property summary: 5 bedrooms, 9 beds, 3 bathrooms, hot tub, soaker tub, large deck, epic mountain views, propane BBQ, cable, smart TV, wifi, laundry, outdoor parking for 5+ vehicles, carport for 1. ONLY available from April 1st through to May 15th, 2019. $2500/month, utilities included.